Before the new Hellboy movie hits theaters on April 12th, you can get an in-depth look at the making of the movie in Hellboy: The Art of the Motion Picture, a new hardcover coming to store shelves on April 9th from Dark Horse Comics. Read on for the full announcement for Hellboy: The Art of the Motion Picture, and in case you missed it, Dark Horse will also be publishing Hellboy: 25 Years of Covers this summer to celebrate the 25th anniversary of Mike Mignola's iconic character! 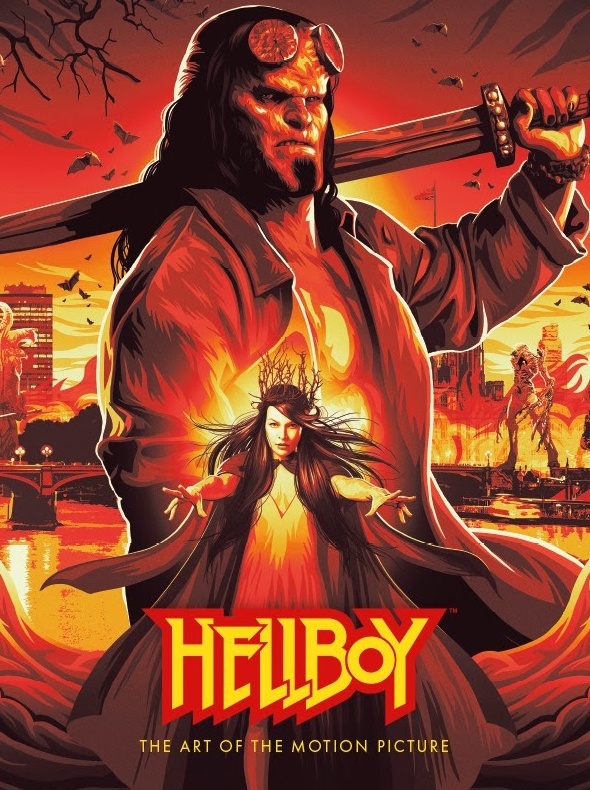 Press Release: MILWAUKIE, Ore., (February 6, 2019)—Dark Horse Comics will publish Hellboy: The Art of the Motion Picture, a gorgeously designed hardcover book that showcases concept art and set photography to offer a behind-the-scenes look at one of the most highly anticipated films of 2019. The book offers an inside look at the creation of the film with nearly one thousand pieces of art and photography in 200 full-color pages. Hellboy: The Art of the Motion Picture will be published on April 9, 2019, ahead of the release of the Neil Marshall’s Hellboy film starring David Harbour, Sasha Lane, Ian McShane, Penelope Mitchell, Daniel Dae Kim and Milla Jovovich. Based on the acclaimed Hellboy comic books and graphic novels created by Mike Mignola, Lionsgate’s Summit Entertainment label will release Hellboy nationwide on April 12, 2019. Founded in 1986 by Mike Richardson, Dark Horse Comics is an excellent example of how integrity and innovation can help broaden a unique storytelling medium and transform a company with humble beginnings into an industry giant. Under a new partnership with Vanguard Visionary Associates, Dark Horse is positioned to further expand its reach globally with publishing, products, and filmed entertainment. Over the years, Dark Horse has published the work of creative legends such as Yoshitaka Amano, Margaret Atwood, Paul Chadwick, Geof Darrow, Will Eisner, Neil Gaiman, Dave Gibbons, Faith Erin Hicks, Kazuo Koike, Matt Kindt, Jeff Lemire, Mike Mignola, Frank Miller, Moebius, Chuck Palahniuk, Wendy Pini, and Gerard Way. In addition, Dark Horse has a long tradition of establishing exciting new creative talent throughout all of its divisions. The company has also set the industry standard for quality licensed comics, graphic novels, collectibles, and art books, including Aliens, Stranger Things, Avatar: The Last Airbender, The Legend of Korra, Predator, Minecraft, The Legend of Zelda, Super Mario, Dragon Age, James Cameron’s Avatar, Game of Thrones, Mass Effect, StarCraft,The Witcher, and Halo. Today, Dark Horse Comics is one of the world’s leading entertainment publishers.